Please join us for the UND/SCSU pre-game social, an annual event which provides an opportunity for fans of the University of North Dakota and St. Cloud State University to gather, celebrate the great sport of hockey, and view the Challenge Cup, a traveling trophy which is presented to the team which collects more points in the four regular-season games between the schools. North Dakota earned the trophy last year with a pair of shutout wins (4-0, 3-0) in St. Cloud and a home overtime victory in Grand Forks. St. Cloud State has the upper hand in this season’s race with a home win and a tie back in December. This event will be held on Saturday, March 3rd from 3:00 p.m. to 6:00 p.m. at El Roco Bar and Grill (1730 13th Avenue North) in Grand Forks. El Roco is smoke-free, and the event is free and open to the public (due to the venue, guests must be 21 years of age or older). 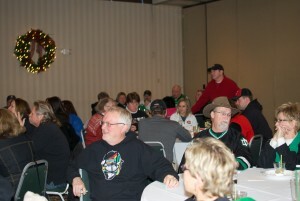 A free appetizer bar will be provided, everyone in attendance will have the opportunity to win door prizes, and a hockey bus will take fans to Ralph Engelstad Arena and back again after the game.